The NRA has done the nation a tremendous service by rating politicians. The most manly — which is to say, the most servile — earn a solid A. Those most resistant to lockstep loyalty earn an F. Guide yourselves accordingly. Refuse to vote for a candidate who has received anything better than a D from the National Rifle Association. Be generous: Senate Majority Leader Harry Reid may not run again, but if he makes good on his change of heart — if he trades his disgraceful B rating for a D or an F — then offer him your qualified support. The issue here is not freedom: it is the opposite. It is blackmail. Decent people are afraid to run on an anti-gun platform, because the NRA makes it very clear that they will then fund a reliably bloodthirsty opponent. Hence, the second prong of any successful bid to topple the NRA’s stranglehold on America’s freedom is money. Lots of it. If a national organization devoted to the election of D and F candidates could achieve a budget to rival the gun lobby’s — and for the first time in history this seems possible — then it could effectively neutralize these threats. A new surgically-focused lobby would infuse funds into any campaign endangered by blackmail. This would be the precondition for eligibility: intimidation by the NRA. Mayor Bloomberg understands more than most how “independence” here is not so much a lofty ideal, as a brute financial fact. His own independence — his personal wealth — renders him untouchable. It has not, however, rendered him soft. Bloomberg has demonstrated unparalleled leadership throughout this conflict, and I can think of no one better to marshal the forces required. Versions of what I am calling for already exist, in various forms — some local, some national — but nothing on the level of an army as well-funded and relentless as the National Rifle Association. The military language is deliberate, of course. A war is precisely what we are discussing: a bloodless war, along the lines of the Velvet Revolution. Contrary to the old saw, you don’t have to bring guns to a gun fight. In the modern era, superior tactics and ruthless determination have enjoyed a surprisingly good track record against blunt force. Never forget that this is very much a war, however: a battle against an organization that endangers the lives of your children. The third prong of this attack is linguistic. The NRA does not like to see themselves described as “an organization that endangers the lives of your children.” They bridle at such language. Too bad. Winning this war requires a merciless commitment to the truth. This means truthful description and truthful terminology. The word “freedom,” for instance. We never hear Americans talk about freedom from the Second Amendment. Note how odd that sentence sounds. The very terms of the debate have been defined by quasi-medieval vigilantes, who stockpile weapons against a fictional doomsday scenario in which their “freedom” will be taken from them. Most Americans, however, wish to be free from these people. It is a natural wish, shared by humans around the world: a defining feature of liberal democracy is the protection of citizens from armed, unelected thugs. Life, liberty, and the pursuit of happiness. The NRA would deprive you of the first and third, by redefining the second. Gun hoarders are not, fundamentally, champions of democracy. Their cherished form of governmental transition is not the election of a new administration: it is the overthrow of a regime by violence. This is the scenario they have armed themselves to enjoy. It is their idea of a voting booth. Some will dismiss this as an extreme characterization. A parody. I’ll ask these people to consider how many Americans purchased guns in anticipation of Barack Obama’s reelection. Ponder this. We are discussing citizens of a civilized nation, arming themselves in the event of a candidate winning office through a free and transparent election. These people are not committed to freedom. Or rather, they are committed to a definition of freedom that is not recognized anywhere else in the free world. When I talk about “freedom from the Second Amendment,” I am talking about freedom from a very specific fantasy regarding that amendment: a paranoid understanding of its content and intent. America deserves to be free from a survivalist reading of the Second Amendment. Unfortunately, the Supreme Court — in a predictable 5-4 decision — has determined that this perverse reading is in fact consonant with the intentions of the Founding Fathers. The “some” who “think” — the people to whom Scalia refers — are the citizens of America who do not wish to see their children gunned down with semi-automatic weapons. Scalia is of course correct: to pronounce the death of the Second Amendment is properly the job of another branch of government. And it would be hard to overstate the madness of pursuing that path: the sheer folly of suggesting that perhaps it is time to re-amend the Constitution. Those who consider amendment sacrilege — who shriek at the very thought of tinkering with the Constitution — will not be easily swayed: they are bitterly wedded to their amendment. Scalia’s majority opinion, by the way, puts the lie to his purported originalism. Nobody genuinely concerned with the Founding Father’s intent would ever use these words: “our standing army is the pride of our nation.” Very few things terrified the Founding Fathers more than the idea of a standing army. The well-trained militia was, yes, intended as a substitute for a standing army. And now that America has the second largest standing army in the world, this provision is little more than an inflamed vestigial organ: a diseased appendix to the body politic. Today’s self-styled militia is restricted to a group of paranoid he-people, who genuinely believe that they could — if necessary — overthrow the American government with their .223 caliber Bushmaster semi-automatics. 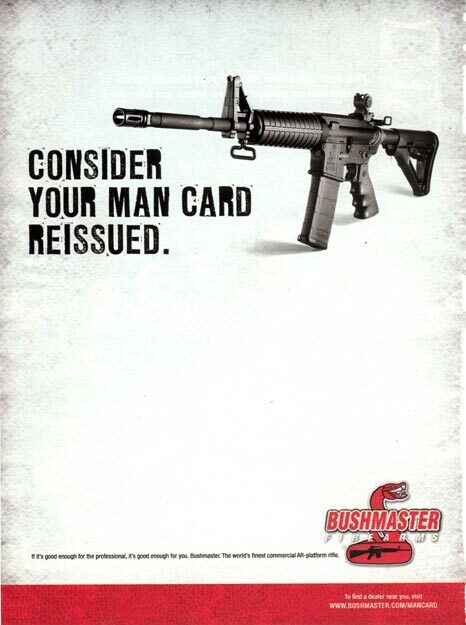 In its advertisement for the type of weapon used by the child-killer Adam Lanza, Bushmaster’s slogan reads: “Consider Your Man Card Reissued.” Lots of people out there feel as if they’re man-card-carrying alphas. And if they were to take up arms against the federal government — which is to say, against the United States Armed Forces — they would be squashed like cockroaches. Their Bushmasters would be approximately as useful as squirt guns against Apache attack helicopters, for instance, which have rarely been brought down by missiles far more powerful than anything available to an American civilian. Sorry, my rugged individual, but your “well-trained militia” is a joke. Consider your cockroach card reissued. No, this side of Afghanistan, your Bushmaster M4 Type Carbines are useful for one thing, and one thing only: hunting humans. Preferably children, because children are never in a position to return fire. Bushmaster Firearms International, LLC — a fantastically wealthy and cynical corporation — has reissued your faux man card, and it is time for decent citizens to take it away. Perhaps you’ll be issued a human card, if you properly demonstrate that you deserve one. That charming ad also has this to say: “If it’s good enough for the professional, it’s good enough for you.” Um, no. If it’s good enough for the professional, it should be kept far away from you. Unless you wish to become a professional. This is of course a very real option, for people who wish to earn their man card: join the Army. You’ll be issued a fully automatic version of this weapon — in case you consider Lanza’s a toy — and you’ll be up against armed people who shoot back, as opposed to children. I will be accused, I know, of “exploiting this tragedy.” Fine. Guilty as charged. I urge you to join me: exploit the hell out of this bitter, hellish situation, if it means preserving your children from killers enabled by the gun lobby. Do not let anyone tell you that, “Now is the time to mourn, not fight.” This is precisely wrong: now is the time to mourn and fight. If the NRA insists that “we should not play politics with tragedy,” I assure you: it’s not a call for decorous behavior. It’s an exhortation to lose. You don’t want to do anything so crass as to found a lobby and raise money while the nation is grieving. Do it later, when you’re guaranteed to fail. This, then, is the crucial three-pronged approach to ending the tyranny of the NRA. Votes. Money. And language. You may despair that this is all that you have, when you’re up against semi-automatic rifles. I assure you, however: it is more than enough. Better-armed strongmen than the National Rifle Association have been brought down by unarmed opponents. The citizens of Eastern Europe, for instance, did not outgun their tyrants. This requires a different category of heroism. An F candidate is an American hero, yes, and should be welcomed to office as one. He or she ought to be funded properly, so that the gun lobby ceases to be a factor in otherwise healthy elections. And “freedom” should be redefined to mean what the word means elsewhere in the free world. Decent people deserve a less Orwellian shade of freedom. They should insist upon, for instance, freedom from arbitrary death at the end of a gun blessed by the National Rifle Association. They should demand freedom from the NRA itself: a venomous bloc who would make their children fair game for paranoid thugs; a lobby whose express purpose is to insure that these thugs have the right to carry semi-automatic weapons, high-capacity magazines, and man cards. I’ll leave you with a quotation that has been floating around the internet in the last few days, in various forms. I do not know the origins, but it is easy enough to verify the content. May it go viral. From 1984 to 1996, Australia had over a dozen mass murders by firearms, largely copycat killings prompted by media coverage in the U.S. and in Australia. Unstable people do insane things. After one lone nut gunman killed 35 and wounded 21 people in 1996, the Port Arthur Massacre, Prime Minister John Howard banned all semi-automatic rifles and pump-action shotguns because of the outrage felt by Australian citizens. He introduced highly restrictive gun licensing laws. Hundreds of thousands of guns were purchased from Australian citizens and destroyed. Do you know how many mass shootings we have had since then? Not one. In addition, firearm homicides have dropped 59% with no corresponding increase in non-firearm murders. People kill people, not guns? Rubbish. Guns give the mentally ill ruthlessly efficient killing power, and escalate domestic violence from assault to homicide. The US needs to act now, and the gun lobby needs to wake up to its culpability.